RUNS AND GETTING 'OUT': The batting team is attempting to score as many runs as possible; the bowling team is trying to limit the number of runs scored and dismiss all the batsmen. A run is scored when the batsman strikes the ball and successfully runs to the other end of the wicket without being dismissed. If the ball reaches the outer boundary of the field, he scores four runs. If it does so without hitting the ground, he scores six. Batsman can be dismissed by being bowled (hitting the wickets in the act of bowling), caught (obvious), or being stumped (the fielding team hitting the stumps with the ball when the batsmen is away from them). 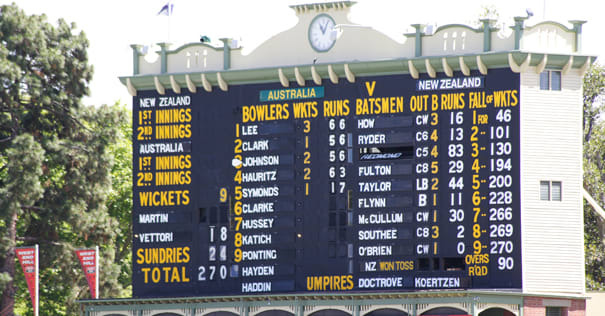 INNINGS AND WINNING: Matches commonly see both teams having two innings. An inning is over once all the batsmen are dismissed or the maximum allowed overs is reached. The team with the most total runs wins.